Lightweight and strong infrastructure solutions that are economical, resilient and sustainable in remote locations and harsh climates. Our infrastructure solutions are site-designed for Northern construction conditions with flexibility built in. We understand the unique requirements of the North and our infrastructure solutions reflect that. Our lightweight and strong infrastructure solutions are economical, resilient and sustainable for Northern construction projects of all types. We specialize in value-engineering infrastructure solutions for specific sites and, with locations and teams across Canada, we are well poised to work with your project group and deliver the best solution for your budget and application. Build in value; talk to one of our Northern Infrastructure Specialists. Contact one of our Northern Infrastructure Specialists at 1-877-245-7473 or info@ailnorthern.ca. 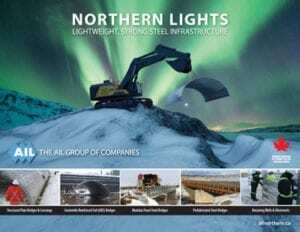 See the full range of our lightweight and strong steel infrastructure solutions for Northern construction. See the full range of our Northern Infrastructure Solutions for a wide variety of applications. A full line of solutions for all types of structures – from the smallest culverts to huge river crossings of up to 35 m (115’) – all value-engineered to your site. Avoid the hassle of replacing older ​transportation infrastructure​ with custom-fit inserts made to order from the AIL Group of Companies. Available for sale or rental, we maintain a ready-to-ship inventory of these robust ‘quick-build’ bridge systems for site assembly by local teams. Pre-engineered and manufactured to tightly-controlled tolerances, Algonquin Prefabricated Bridges are easy to transport by road, ship or barge and can install in one day. These historically-proven, cost-effective systems have minimal equipment and labour requirements and they adapt well to curves, angles, and steps. Lightweight and easy-to-install AIL Sound Walls are made from steel posts and PVC panels that are impervious to weather and virtually maintenance-free. In the Peace River area of Northern British Columbia, severe flooding had completely overwhelmed a 900 mm culvert and washed out busy Highway 97 at Grizzly Creek, near Chetwynd.